Moderate flooding is likely in parts of New England and the Lower Missouri River Valley, while California's drought is unlikely to budge. 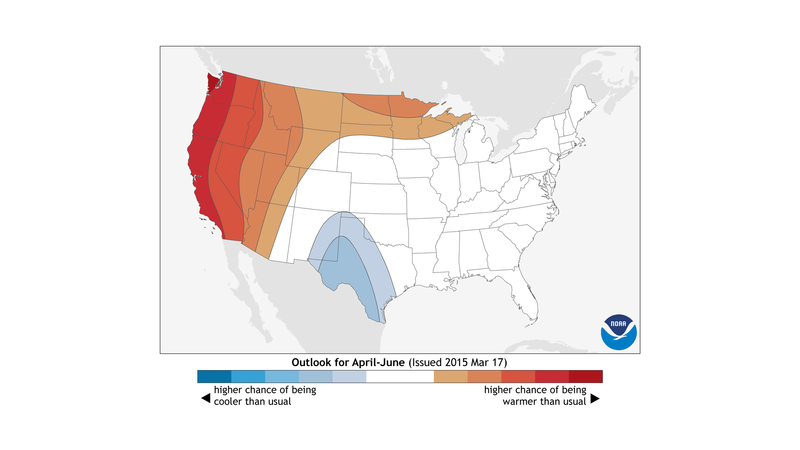 Well-above-average temperatures are predicted for much of the West and Alaska. Risk of moderate flooding for parts of central and eastern United States this spring. 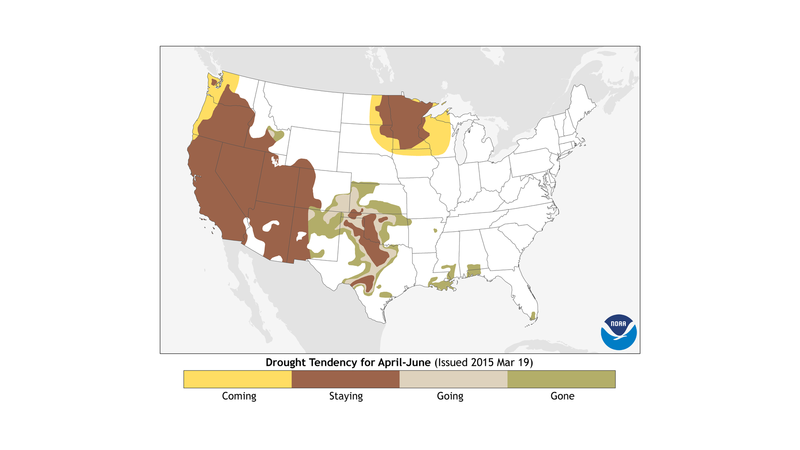 No drought relief in sight for California, Nevada, or Oregon. 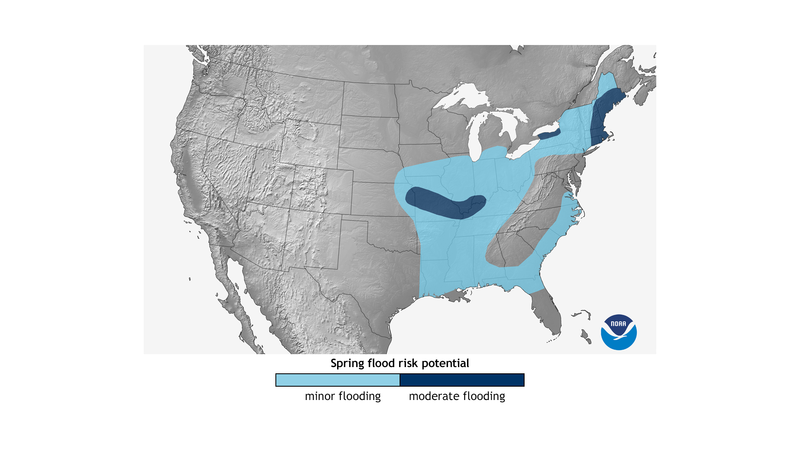 According to NOAA’s Spring Outlook released today, rivers in western New York and eastern New England have the greatest risk of spring flooding in part because of heavy snowpack coupled with possible spring rain. Meanwhile, widespread drought conditions are expected to persist in California, Nevada, and Oregon this spring as the dry season begins. “Periods of record warmth in the West and not enough precipitation during the rainy season cut short drought-relief in California this winter and prospects for above average temperatures this spring may make the situation worse,” said Jon Gottschalck, chief, Operational Prediction Branch, NOAA’s Climate Prediction Center. 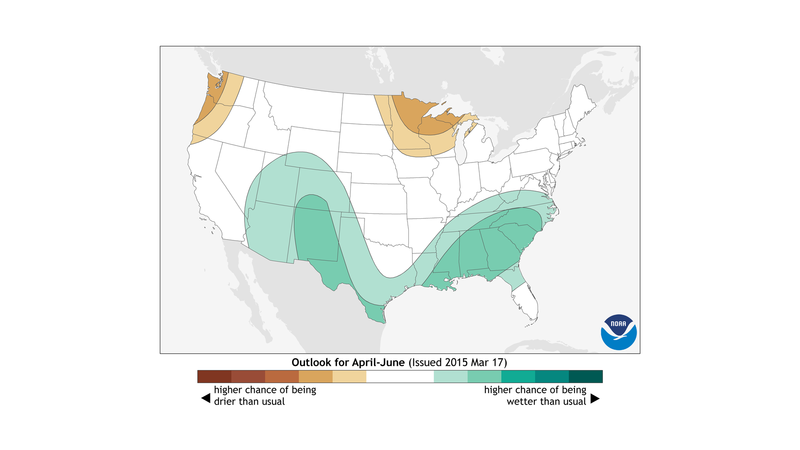 NOAA’s Spring Outlook identifies areas at risk of spring flooding and expectations for temperature, precipitation and drought from April through June. The Spring Outlook provides emergency managers, water managers, state and local officials, and the public with valuable information so they will be prepared to take action to protect life and property. After another winter of extremes, from record warmth out west to cold and record snows in the Northeast, you may be wondering what spring has in store for your part of the nation. Record-breaking snows in western New York and eastern New England along with significant river ice has elevated the risk of moderate flooding. Parts of the lower Missouri and lower Ohio River basins also face that risk. NOAA predicts minor flooding potential from the Gulf Coast through the Ohio River Valley, into the Northeast, and in parts of the Southeast. Major river flooding does not appear to be a big concern as we head into spring. Entering winter, over half of California was experiencing Exceptional Drought, and despite a very wet December, Exceptional Drought remains over nearly 40% of the state, as very dry conditions returned in January. And as we head into their dry season, the April-June outlook offers little relief for this long-running drought. Elsewhere, precipitation is favored to be above average in Hawaii, parts of Alaska, and in a region encompassing the Southwest, the southern and central Rockies, western and southern parts of Texas, and much of the Southeast. Odds favor drier than average conditions in the Pacific Northwest and across parts of the Upper Midwest, regions where drought is likely to develop or persist. Remember, these maps show only the most likely outcome. There is always some chance that seasonal amounts will be below-, near-, or above-average. Above-average temperatures are favored across Hawaii, Alaska, much of the far West, and along the Northern tier to the western Great Lakes. Below-normal temperatures are most likely in eastern New Mexico and Texas. Both maps have parts of the country labeled E, C, for “equal chances,” which means there is no tilt in the odds towards either above-, near- or below-average temperature or precipitation. Remember, the Spring Outlook does not rule out hazardous weather anywhere. Stay tuned to NOAA to be weather ready and climate smart. From NOAA’s Climate Prediction Center, I’m Mike Halpert.